This isn’t a SCART switch, but it might be of help in certain setups. Perhaps you own an XRGB3 and a DVDO Edge or other processor. You might want to use the DVDO’s deinterlacing for 480i material and the XRGB3’s upscaling for all 240p material. Of course, it all comes down the same SCART wire which means a cable swap unless you have a switch with multiple outputs (like the Shinybow for instance). Adding a SC-AMP2 to the setup is an easy solution. You feed in one SCART signal and get two identical ones out. There’s no perceivable loss of quality (the splitter requires power, of course) and both RGB and Component video is supported. Sadly the SC-AMP2 has been discontinued and doesn’t show up on eBay very often. 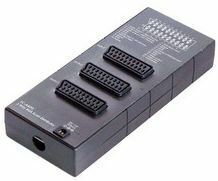 If you need a SCART splitter and you can find this model, it will suit your needs perfectly. A handy little gadget, if you can ever find one. Hi, yes the Cypress SCART Splitter SC-AMP2 are discontinued however we have one left in stock for Australian consumers.